Prize DrawsWin a pair of shoes of your choice from Hotter! 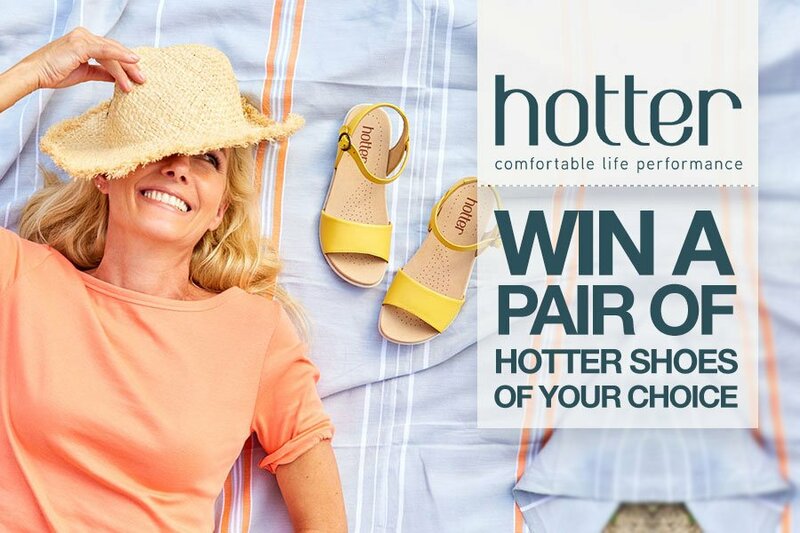 Enter this Prize Draw to be in with a chance of winning one pair of shoes of your choice from Hotter.com up to the value of £170, including all women’s and men’s shoes and boots! Celebrating 60 years of footwear innovation, Hotter are proud to be the UK’s largest shoe manufacturer boasting a world-class production facility that produces 2.2 million pairs of men’s and women’s shoes each year. Every pair is crafted and extensively tested in The Comfort Lab, in Hotter’s UK factory, to the highest quality standards. Expertise, specialist knowledge and technical innovation work in harmony to ensure that their footwear brings comfortable performance into your life. Using a combination of innovative robotics and human craft, they deliver up-to-the-minute styling and a world-renowned precision fit. Start your journey to pure comfort today with a pair of cushioned and stylish Hotter shoes. Clever little details in every pair create healthy, happy feet with on-trend style nods throughout the whole range. Choose from a wide variety of shoes, boots, sandals and GORE-TEX® footwear that not only look great but feel wonderful all day, every day. Enter our prize draw to win any pair of shoes at hotter.com today and you can take your pick – what would you choose from the Hotter collection? A fabulous prize, fingers crossed. a great range of stylish yet comfortable footwear . Great Prize to win, their shoes are not cheap. Time I had a new pair of shoes, mine let the rain in. Gorgeous yellow shoes, never had a pair of yellow shoes. Fingers crossed!! I would love the opportunity to win a pair of Hotter shoes! I have literally worn out my old ones as they are so comfortable. I am on my feet most of the day caring for my severely disabled son so I need Hotter's magic shoes to keep me going! They look exceptionally comfortable and supportive footwear, as well as stylish. I would love to win this prize! I would love the opportunity to try Hotter footwear. Love the bright coloured sandals ...have not tried this brand before ..would like the chance to try.!!! Hotter shoes are so comfortable they are like slippers and I have several pairs. I would not buy any other make of shoes. New pair of shoes, great! Love Hotter shoes but they are expensive. Please write your comments here...Looking sooo comfortable! Would love some of these comfy shoes. Love Hotter shoes, so comfy. Love Hotter shoes. Want some for summer! I live in Hotters, they are like home !! I love Hotter shoes and have a couple of pairs. Can't have new feet, will settle for new shoes!! Love hotter shoes...so so so comfortable! Hotter produce such lovely quality footwear in great styles. Sheer bliss. Hotter shoes just sooo good for my feet. My Hotter boots are so comfortable it’s like wearing a pair of slippers! Always the most comfortable shoes and sandals out there. Never bought Hotter shoes. Hope they have comfort as well as good looks! Footwear that make my feet feel younger ! love hotter shoes very comfortable. Having bad feet due to arthritis, hotter shoes are so comfortable. Hotter shoes are always so comfortable. Never tried Hotter Shoes, looked in the window, but would like to see if they are worth the price! My Hotter walking boots are the most comfortable and hard-wearing footwear I own. My mother loves her winter Pixie boots! Really like the Haven sandals. Black, brown & silver! Comfort with style!! What’s not to love? my feet and i love hotter shoes. Love my Hotter trainers, so comfortable. Would love some summer footwear so I'm keeping my fingers crossed! Hotter shoes are so comfortable and long lasting. A pair for the summer would complete my wardrobe. I would be pleased to hop out of winter brogues into bright hotter shoes. I have problems walking would love a pair. Hotter are the most comfortable shoes I have worn. The most comfortable shoes !`ve ever worn. I love my Hotter shoes. Makes all the walking I do so much more comfortable. I would be delighted to try Hotter Shoes, I hope that I win a pair. Love Hotter Shoes. I have several pairs but would love more. Comfy feet without slippers..can’t be bad eh? We are all in need of new shoes. Love Hotter shoes, and after having three operations on my poor little feet, I find them to be so comfortable. Very comfortable shoes and now stylish too! All of mine and my husband's shoes, sandals and boots are from Hotter. We would not buy any others as they are so comfortable, look great and wear so well. I’d look hotter than summer itself in a gorgeous pair of new sandals! Great shoes for all occasions!! I’ve bought so many pairs of Hotters in the past as they are so comfy and suit my feet. I’ve now managed to get my husband to look and he has bought several pairs too. Don’t actually know what I would do without them! I absolutely love Hotter shoes and boots. I bought boots for last winter and they were never off my feet! They are so comfortable and the wide fitting is perfect for my feet! Can’t get enough of Hotter shoes! Beautiful shoes! So soft and comfortable! Everything crossed for this one. Wonderful prize. They come highly recommended. I love Hotter shoes!! Winning this prize would be amazing. One of the few places I can buy size 9 ! Well made comfortable shoes. Fingers crossed. By far the most comfortable shoes I've ever worn. Would love to win this draw. I have got a few pairs of Hotter shoes and find them very comfortable, being I have a wide foot. Love hotteer shoes so comfy. My sister who has worn them for years told me about them, I thought they were for old people, not at all. Bought my first pair of boots last year and have worn them continuously, absolutely love them. I would love a pair of Hotter shoes, after my double bunion surgery my feet could do with spoiling, fingers crossed. Would love to try Hotter shoes. Would love to try them but too expensive if I can't get on with them. I have plantar facsitas, so have loads of shoes that are uncomfortable!!! No confirmation received. Have I entered or not? So comfortable to wear and lovely design. Love Hotter shoes, they are so comfortable and do wear well. I bought some a few years ago for my wife and she swears by them. It would be nice to win her another pair(s) now please. Might even get a pair for myself also. Lovely shoes both my husband & I wear them. Never any sore feet with hotter ., so comfortable. Such comfortable shoes, love them! It would be lovely to own another pair of Hotter shoes. They are so comfortable. Love hotter shoes. So comfy yet stylish and winning them would be great. I love hotter shoes they are so comfortable and have so many lovely styles. Need some comfortable shoes in my life . Another nice prize for someone to win.G.L.A. I have only just joined Silver surfers, but I have looked on the web pages and enjoyed the jokes, photos and comments. I have one pair of Hotter SANDALS AND THEY ARE REALLY COMFORTABLE AND SMART WOULD LOVE ANOTHER PAIR. This is a great prize. I would love the opportunity to replace my Hotter Shake shoes in time for the summer. I had a very painful foot condition last year and couldn't wear sandals. My Shake shoes were a godsend, so supportive but comfy. Never needed a super pair of shoes as much as i do at the moment. Love my Hotter shoes and would like to win another pair. So comfortable. I would love to try these shoes from hotter, to see if they will help with posture & my back. Just love the hotter shoe range. Hotter footwear, like walking on air. Because of bunions I despair! Hotter means comfort, EVERY PAIR! Better shoes money can’t buy. Another pair to add to my collection! Love Hotter shoes. It would be wonderful to win this prize draw. Would love to win, fantastic choice of footwear. I love the comfort of Hotter footwear. One of my favourite makes in shoes and sandals, so comfy. I have about 6 pair of Hotters, love them, last for years. Wearing these shoes is like walking on air! I have 2 pairs of Hotter shoes that are my “go to” shoes for every day at work. They are so comfortable it’s like wearing gloves on your feet, yet stylish enough ro wear with trousers or a skirt. I love them! I would love to win a pair of Hotter shoes. Have bought many pairs of boots in the past, they are just so comfortable. Worth every penny. Just treated myself to new sandals, well you can never have too many pairs. I bought a pair of Hotter's men shoes 4 years ago. They still look very smart and are still really comfortable. I would love to get another pair. I've lost count of the number of pairs of Hotter shoes my wife has bought!! - She has now found an actual Hotter shop OMG!! Comfy shoes for my aching feet! Hotter shoes although expensive are worth their weight in gold. They are soft, strong and very comfortable and last longer than most shoes. Hotter shoes are the best! I would really love to win this prize. Hotter shoes are so comfortable! Smart and very comfy, what more can you want? Love shoes and Hotter are so comfortable. I would love a new pair of Hotter trekking sandals, perfect for long walks on days out. The most comfy shoes around. Would love to win a comfortable pair of pretty sandals for my size nine feet . They look so comfortable, hope I'm lucky. Would love to win this prize as Hotter shoes are the best for comfort and style. Hotter shoes are so comfortable and the choice is immense. Very comfortable shoes. Look good for so long. Suffering from an ingrowing toe nail, would love a pair of really comfy shoes. Love hotter shoes so comfy. Love Hotter shoes. Would love to win a new pair. Hope I win - brownie points from the Mrs if I do - she loves Hotter shoes, and being able to get an extra wide fit, finds them very comfortable. The Most Comfortable shoes -never need breaking in. I could do with a comfy pair of shoes. Going to a wedding in May so fingers crossed. Love shoes that are comfortable and aren’t a dead uncomfortable weight on my feet! Please write your com ments here...i could do with a really comfortable shoes. Great opportunity to win a great prize. Love Hotter shoes. Love Hotter shoes; comfort and style. Fabulous combination , comfort & style ! Never had a pair of Hotter shoes, but have been told that they are so comfortable. Big fan of Hotter Shoes, I envy the person who wins! Just purchased a pair of blue shoes need a second pair for work, so comfortable. New comfortably reliable shoes for summer, what more could a girl want. I'm hot to win a pair of Hotter's...! Have a lot of difficulty finding shoes that fit as my feet are small and wide so double trouble! Fingers crossed! Comfiest shoes, sandals and boots ever. Suffering problems with my feet. Would love a pair of hotter shoes. I’m on my feet 12 hours all day doing a security position. My colleague swears by Hotters, I’d love to win a pair to treat my feet to! Best shoes ever, very helpful staff, easy delivery and returns. Altogether a great company to deal with! I have never had a pair of Hotter shoes looking forward to seeing if they are as good as I have heard. Hotter shoes are the most comfortable shoe ever invented! A real treat for your feet! Would love to surprise my wife, who loves Hotter shoes. A bit expensive, but very comfy & look good. life so a replacement would be really useful. Going on Holiday soon would be great to wear a pair of Hotters shoes and show them off. Have several pairs , but can always do with more stylish and comfortable shoes! Fabulous footwear, I would love a new pair of these shoes!! Always like hotter shoes,they are very comfy. Hotter footwear are the best and most omfortable. Love Hotter shoes. Good luck everyone. Could never afford them ,so winning will be such a treat. I've heard so many wonderful comments on how comfortable Hotter shoes are I'm dying to try a pair myself. Incredible shoes ,great choices ,trendy stylish whats not to love about this prize? Oh to have a comfortable pair of shoes !!! I live in my Hotter shoes, lots of different styles and colours, just love them! Hotter shoes are the best . So cumftable . It’s like walking on air . I have worn Hotter shoes for more years than I care to remember. Once you have a pair of Hotter shoes on your feet, you never want to wear anything else. At last Ive found shoes that actually fit, thank you Hotter! Thanks for giving me the opportunity in entering this great competition ! Hotter shoes are always good quality, stylish and comfortable. yes please, I love "hotter shoes" good luck everyone. Pure comfort, stylish, can be worn on many occasions. I bought a pair of hotter sandals two years ago and my feet haven’t stopped saying THANKYOU. Hotter are the best shoes I have ever worn, comfortable and stylish. What more could you want-except a free pair ! Please please please, good luck everyone. Have heard great things about these shoes. Would love to try them. These shoes were made for walking!! I would love to win a pair of your sandals as I understand they are very comfortable and stylish. Have never had any shoes from Hotter so would love to win these shoes for when I go on my daily walk. Going on holiday soon would be fantastic to wear a pair of Hotter shoes. Love these they are sooo comfortable . Love these they are sooooo comfortable. It would be lovely to have a pair of shoes that are comfy as well as fashionable. Great new summer styles and colours!! I always look in the Hotter shop window and think they are too expensive for ME, but would love some ! Hotter shoes are my favourite! So comfy! Hotter Shoes mean a better quality of life when you have unusual feet. Pretty designs in real leather, stylish and comfortable. Hope to win a new summer pair. Love Hotter shoes, so comfortable! I need to insert a wedge that my podiatrist precribed me. Hotter shoes always accommodate it and remain the most comfy and secure feeling footwear ever. Hotter shoes are the most comfortable and well made shoes I have ever had, perfection! Love Hotter shoes, so comfy ! They have got to be the best shoes ever, hope I win. Walking in hotter shoes is like walking on air. Love the comfort of Hotters fingers crossed. They are the most comfortable shoes I have ever had; the walking shoes with Gore-Tex are superb. With advancing years we all need to take care of our feet. Hotter shoes do this without sacrificing a fashionable look. Keeping my legs crossed that I will win this amazing prize! Hoping I'm winning a pair of great Hotter shoes! Hotter shoes are cool for summer! about time I had a new pair of hotter shoes, and even better to win some! Love to win a new pair of Hotter shoes for the summer months. Hotter shoes are the best, really comfortable on my feet. I am so glad I got them. These are the most comfortable shoes I have ever worn. Bought my first pair last summer. Most comfortable shoes I have ever found. I love Hotter shoes. Discovered them a couple of years ago and have about 8 pairs now including boots and sandals. They are so comfortable and yet still stylish. Never tried them before, so what the heck, let's have a go. I love hotter shoes for their comfort and style. I have never tried hotter shoes but as I`m getting older I find one or two, more expensive pairs of comfortable shoes will last me a couple of years. I would love to win a pair of these, so fingers crossed I might. Thanks. I’ve spent loads on rubbish shoes, insoles, etc. No more! It’s Hotter for me all the way now ! Love Hotter shoes. Have just bought another pair! Love Hotter shoes.. most comfortable shoes I have worn. Yes please I would like some new shoes. Would love some Hotter shoes. I’ve had Hotter slippers and they were superb, lasted me ages. I need some new comfy shoes to go to Buckingham Palace Garden Party in May. My poor old feet need a treat. Just had a foot op and need a new pair of comfy shoes to go with my new foot! My poor feet! I have such difficulty finding shoes that don't hurt these days. I'd love some. Yes please, just what I need. Absolutely the finest shoes for walking. would love to win a pair of shoes - they look fabulous. Hotter shoes are so comfy but expensive. I would love to win a pair of boots. These shoes are brilliant - but price prevents me from buying as many as I'd like: would love to win a pair. Love Hotter shoes would always welcome another pair. My partner wears Hotter shoes so I should have a go. I’ve only ever had 1 pair of Hotter shoes but they were lovely, beautiful soft leather.id love another pair. Would love to win a pair of hotter boots! I had a pair of Hotter shoes a while ago and I loved them. I'd love another pair. so comfortable for my awkward feet!! I have two pairs of Hotter boots, the best I have ever bought. Love these shoes - here's hoping! Shoes are so comfy and hard wearing. I love mine. Great, comfortable shoes have never failed to disappoint! Absolutely love Hotter shoes and wear them all of the time. So comfortable. I’d love to win a pair of hotter shoes ready for the summer. My winter hotter shoes will be put away ready for next winter! I've heard such good reviews about these shoes. I would love to try them for myself. As these shoes are so comfortable, I would love to win a pair! Been wearing Hotter shoes for years as did my Mum. Love my walking shoes. Stylish but comfortable shoes from Hotter. I just love Hotter shoes. I have bought nothing else for the last few years! Hope they do small sizes! I love Hotter shoes, but my old ones are tatty now and would love a new pair. I have never tried Hotter shoes until now but so many of my friends tell me how wonderful they are I would love to own a pair. I am relatively new to Silver Surfers but do enjoy you pages - well done. I love my Hotter shoes! I own almost every colour they do in the Jewel shoe range, they are so comfortable and not just for seniors! Would love a pair of comfy shoes. I understand that Hotter shoes are perfectly made for Seniors. It would be nice to be able to afford them, but better still if I won a pair or two. Only found this company last year and immediately loved their shoes. My current pair of Hotters are so comfortable, I wear them every day. Walking on air in a pair of Hotter Shoes. Suffering from Plantar Fascitus maybe I will be able to get some comfortable shoes to help with the problem !! Hotter are so comfy and hard wearing shoes so I have always used them when I can afford to. At "last" a chance for new shoes as my "sole"pair has worn out and left me feeling down at heel and to boot I didn`t like the colour anyway..!!!!! You can never have too many Hotter shoes! Would live to try pair if Hotter shoes as have not tried them before. Hotter shoes are the most comfortable shoes I have worn. Hotters my wife’s favourite shoes. I'd just quite like a pair of comfortable shoes.! Really could do with a 'good' pair of shoes from such a well preferred shop. I always wear Hotter shoes and slippers. They are so comfortable that I have to check that I have shoes and not slippers on when I go out. Would love a pair of hotters have trouble finding comfortable shoes so these would be perfect. Hotter make the best shoes, sandals and boots for my feet I always buy from them so this is a brilliant competition! Would just love to win a pair of your lovely shoes/sandals, thank you for giving me the opportunity of trying, regards, Alison Crabtree. I would feel privileged if I owned a pair of Hotter shoes. Comfort for the sole with every step!